For those of us that raise our own chickens and have had the experience of dressing them out you are well aware of the physiological differences compared to commercial meat chickens. The above photo was a 20-week old Black Australorp rooster. 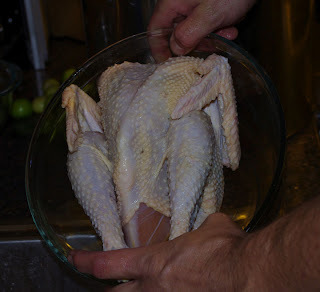 Now compare that to your standard grocery store chicken which generally is no older than 8 weeks old. That’s a pretty substantial difference. The main cause of the difference is genetics. Cornish Crosses are a hybrid chicken that was developed in the 1980’s to put on about a pound per week. Because of this rapid growth they generally cannot live past 12 weeks because they start suffering from heart and leg problems. This breed of chicken is a boon for chicken farmers. They have a great feed:meat ratio and the fast growth means a fast turnover. Unfortunately that fast turnover isn’t fast enough. To help them grow even faster conventional farmers feed the chickens medicated feed. One of the common medications in feed is Roxarsone, which is a anticoccidial. Coccidiosis is definitely a concern when you have huge numbers of young birds in relatively small areas. A side effect of anticoccidial is, of course, faster growth, which isn’t always a bad thing. However, when it comes to using Roxarsone it is something entirely different. Roxarsone contains an organic form (in the chemistry sense, not agricultural “organic”) of arsenic. It quickly converts to inorganic arsenic, which is highly toxic. Most of the arsenic is excreted in the manure, however, with the extremely high concentration of manure that comes out of factory farms it causes a huge environmental and public health hazards when it seeps into groundwater and pollutes waterways. Not all of the arsenic is excreted though and the FDA has finally admitted that supermarket chickens do in fact test positive for inorganic arsenic. But let’s not pat the FDA on the back quite yet. While they said they test positive it added that the levels were too low so they present “no meaningful risk” to those that eat the arsenic laced chicken – which is in line, not surprisingly, with the National Chicken Council. The European Union, which seem much more interested in public health, has banned the use of arsenic-containing drugs in animal feed which helps prove that chicken farming can be done without the use of these hazardous drugs. Pfizer, the maker of Roxarsone, has pulled it from the market voluntarily, but that doesn’t mean we’re safe because there are other arsenic containing drugs that can be used in chicken feed as well. What I find interesting and extremely scary is the FDA’s lackadaisical take on the whole issue. This isn’t the first time I’ve heard about arsenic-containing drugs in chicken feed. Back in July 2010 a story broke about a Utah mother whose children had worrisome levels of arsenic in their urine. Her daughter showed twice the level considered toxic and her son showed 75% more than what’s considered toxic. The arsenic was traced to the Roxarsone in the feed they gave to their backyard laying hens. So the question is, do you have to give up chicken to avoid arsenic? Maybe. Testing in 2006 showed that detectable arsenic was even found in 2 brands of USDA certified organic chicken purchased at supermarkets. Organic standards bar the use of medicated feeds so this is alarming. If you don’t want to give up chicken or eggs I can’t stress enough how important it is to know your farmer. You’ll have to pay more for meat and eggs but you’ll avoid the dangerous chemicals found in most factory farmed foods. Your other option is to raise them yourself like we do. Of course if you go that route you’ll have to make sure to only feed them organic feed as demonstrated by the family in Utah. We've used chick feed with Amprolium for the first couple weeks to prevent coccidiosis. Then we switch over to an organic feed. As far as I can tell through my research, amprolium doesn't have the same concerns. Still. I like to get the drugs out as early as possible. Hey Heidi! We have tried different management practices regarding coccidiosis. We first realized we had an issue when we hand raised our second batch of chicks and they spent the first several weeks of their lives indoors and when we put them out with our hens they got ill with it. The following batch we fed medicated feed and didn't have any problems. Then I looked into how organic producers deal with it since they can't medicate animals. I realized that our very first batch of chicks (which we never had any coccidiosis problems with nor did we feed them medicated feed) were inadvertantly raised the same way organic producers raise them so our last batch I replicated that and didn't have any problems. We now keep our chicks from day one in an open bottomed brooder out in the chicken yard (well, in the kid stall so they are covered). This insures that they have direct contact with coccidia from day one and are then able to build up an immunity to it before they reach the age where it can become a problem. Generally birds aren't susceptible to suffering from coccidiosis until they are few weeks old. Also, keeping them on deep litter helps weaken the coccidia because there are oocyst-eating organisms that thrive in the deep litter. We don't remove/clean it before putting them on it or we won't be able to expose the chicks properly. So far this has been our preferred method of raising chicks. By the way, I'd take your Australorp over Mutant Chicken any day… I really do believe that heritage birds taste better. It's because the EU is run by commies who hate freedom. Last time we went the coccidiosis vaccine route with day-old chicks, so they could receive an all organic diet from day one. The first thing people commented on about our dressed turkeys last year was that they didn't look very fat, and wondered if they were healthy **roll eyes**. I thanked them for noticing that they weren't broad breasted mutants. Part of the problem is, Americans don't know what their food should look like anymore, as we have so many frankenfoods in the grocery stores these days. 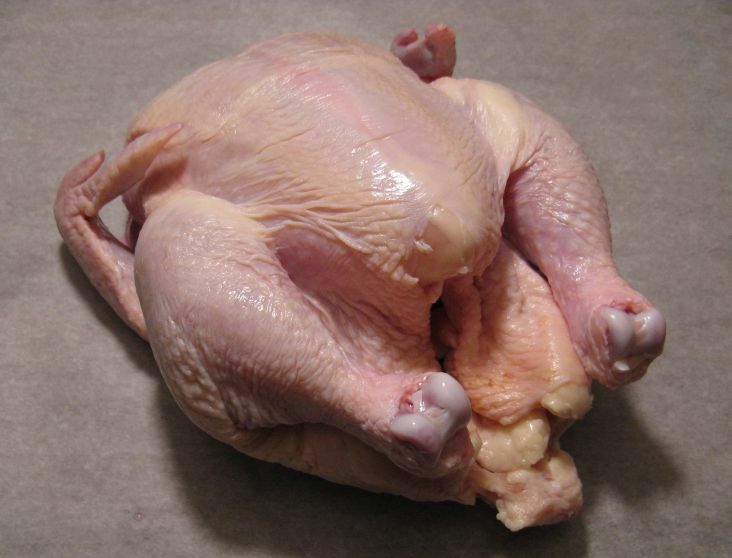 Honestly, anyone who eats commercially produced chicken should spend an afternoon at a commercial poultry rearing operation, and see for themselves the level of discomfort endured by the cornish mutants that ultimately end up plastic wrapped on store shelves. I do have to share something about those Cornish X chickens. However, I'm going to save it for another post because it's long.